Amazon Web Services (AWS) is a public cloud platform that provides solutions and services including virtual machine instances, databases, storage, and more. 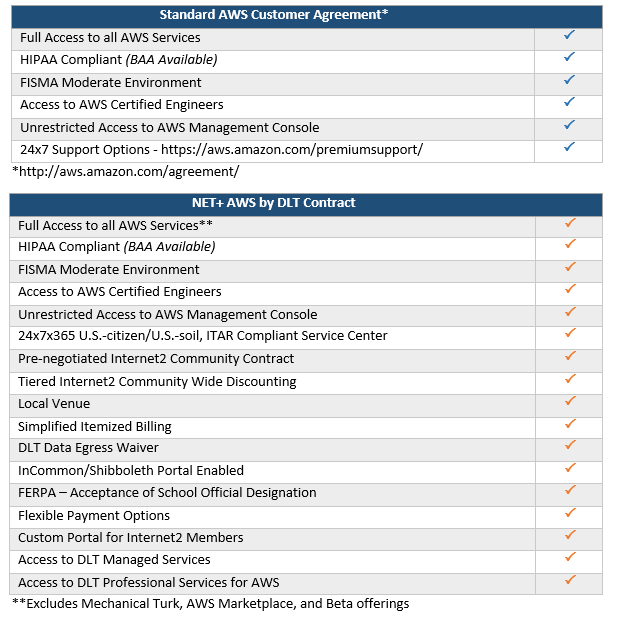 MIT is a participant in an AWS service offering provided under Internet2's NET+ initiative, which provides additional benefits over the "standard" AWS service. Note: MIT leverages private, high-speed peering via Amazon's DirectConnect service. It is not eligible for the Data Egress Waiver. An existing MIT Kerberos username and a valid method of payment, e.g., MIT Purchasing Card or Purchase Order. To gain access to the Internet2 NET+ AWS customer portal, allowing for the creation of new AWS accounts or registration of existing accounts with the service, contact aws-support@mit.edu.